(Bloomberg) -- Call it the nostalgia factor: PepsiCo Inc. is getting a boost from some of its classic brands. The snack and beverage giant posted quarterly results that beat estimates, sending shares to the highest since at least 1980. 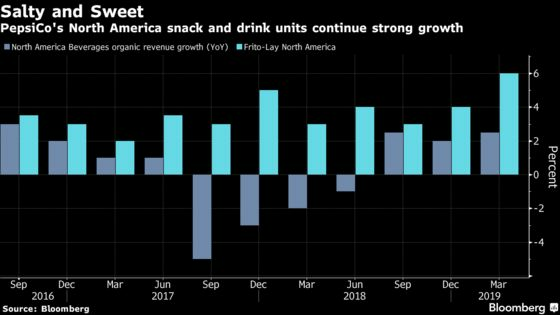 The company’s sales growth was boosted by its key Frito-Lay operation and North American beverage unit, with its Pepsi soda line and Lay’s chips fueling the surge, according to Chief Financial Officer Hugh Johnston. With fierce competition from rival Coca-Cola Co. and other companies, PepsiCo has boosted marketing in a bid to keep its brands top of mind with consumers. And while consumers cutting back on high-calorie soda has hampered some of the sugary brands, the company managed to post 3 percent growth for its overall Pepsi family in the U.S., fueled by a 29 percent surge in Pepsi Zero Sugar sales. The company is also getting a bump from Bubly, a sparking water it released last year that’s taking share from established brands like LaCroix and Perrier. PepsiCo rose as much as 2.1 percent on Wednesday, reaching the highest point ever according to Bloomberg data, which goes back to 1980. Through Tuesday’s close, the stock had gained 11 percent through Tuesday’s close, outpacing the 0.8 percent decline for Coke. Still, there are some challenges on the horizon. After the first-quarter snacks growth, which Johnston called “extraordinary,” it will be hard to maintain that momentum. Shares briefly pared gains when executives said on the conference call that Frito-Lay growth will slow during the remainder of 2019. The company also hasn’t been able to sustain volume expansion in its North American beverages, which has only logged growth in two of the last 10 quarters. Even as high prices fueled revenue gains, volumes slipped 2 percent in the quarter. The company held its full-year forecast unchanged. For the quarter, the company posted organic revenue growth of 5.2 percent, its best top line performance in more than three years, according to Johnston. Profit of 97 cents a share was little changed year on year. Chief Executive Officer Ramon Laguarta, who took over in October, has started to put his stamp on PepsiCo. He expanded a cost-cutting program and promoted Laxman Narasimhan to the new role of chief commercial officer in March, giving him a top deputy as the company grapples with global economic uncertainty and shifting eating habits in the U.S. The company has also added additional truck drivers in North America to bring more of its drinks and snacks to the market. PepsiCo said heading into the quarter it would increase marketing to try to sustain growth in the key North American beverage unit, which faces pressure from rivals that have flooded grocery aisles with less-sugary options to traditional soda. Pepsi Zero Sugar benefited from an ad push, as did Bubly, which ran a spot during the Super Bowl. “The Super Bowl is the best awareness-creating vehicle on the planet,” Johnston said.